My, how deceiving looks can be. At first blush, the Raspberry Pi 3 Model B appears physically identical to the year-old Raspberry Pi 2 Model B: the same port selection, the same GPIO pin layout, the same basic board layout, et cetera. But don’t let that fool you! The leap to the Raspberry Pi 3 is just as significant as the prior upgrade, supercharging performance even further and eliminating what few lingering setup hassles remained in the Raspberry Pi formula, all while maintaining the same dirt-cheap $35 price point. But while the Raspberry Pi 3 is easily the most convenient and powerful Raspberry Pi ever, and the first that can potentially be used as a proper PC, it’s still more of an evolutionary upgrade than a revolutionary one—which is actually a good thing, as it helps the RP3 maintain backward compatibility with previous generations of the beloved mini-PC and maker board. Official distributor Element 14 sent us a Raspberry Pi3 Model B to test, so without further ado, let’s dig in! The Raspberry Pi 3 next to a first-gen Moto X with a 4.7-inch display, for size comparison. The card-sized Raspberry Pi 3’s newfound power lies in a trio of upgrades: A new system-on-chip (SoC) with more potent graphics and computing capabilities, onboard 2.4GHz 802.11n Wi-Fi, and onboard Bluetooth 4.1/Low Energy support. The new features seem insignificant on paper, but they add up to a serious usability boost in the real world—especially the onboard wireless capabilities, which just plain work out of the box with the default/recommended Raspbian operating system. 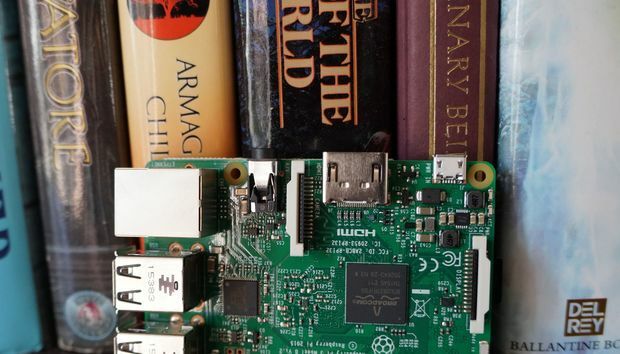 Developing a Raspberry Pi-specific OS to work solely with Raspberry Pi hardware pays dividends in ease of use, it seems, especially since standard Linux installations are notorious for finicky wireless connectivity. The mere fact that integrated Wi-Fi exists is a huge step up from previous Raspberry Pi models, which required you either to pony up cash for a Wi-Fi adapter or hardwire your board via an ethernet connection. Clockwise from top left: The Raspberry Pi, Raspberry Pi 2, and Raspberry Pi 3. That’s not the only concession to convenience introduced in the Raspberry Pi 3. One of the biggest headaches with the original Raspberry Pi was simply connecting everything you needed to it, as the initial version featured only a pair of USB 2.0 inputs. Connecting the basics—a USB keyboard, mouse, and Wi-Fi adapter—required a USB hub, not even mentioning external storage drives or any other gear you’d like to connect to the board. The Raspberry Pi 2 cured that headache by doubling the number of USB ports to four. The Raspberry Pi 3 goes one step further with native Bluetooth compatibility, which comes in handy for connecting wireless peripherals (take note, folks who use the Raspberry Pi as a cheap media streaming box) or gadgets and sensors for more advanced maker projects. Adding the wireless capabilities didn’t increase the Raspberry Pi’s overall footprint, either. The new wireless radio is so small that “its markings can only be properly seen through a microscope or magnifying glass,” the Raspberry Pi Foundation boasts. The Raspberry Pi 3’s new SoC also gives it a big leg-up in performance over the Raspberry Pi 2, which itself blew the single-core original Raspberry Pi out of the water. The Raspberry Pis 2 and 3 both rock quad-core processors, but the latest edition features a quartet of Cortex-A53 CPU cores clocked at 1.2GHz, compared to the Raspberry Pi 2’s 900MHz ARM Cortex-A7 cores. In other words, the Raspberry Pi 3 has more capable cores running at higher clock speeds. Both pack a Broadcom VideoCore IV graphics processor, but the speed’s been bumped from 250MHz to 400MHz in the Raspberry Pi 3. The Raspbian operating system’s default home screen. Boring numbers aside, the SoC’s technical upgrades deliver a hell of a performance and usability upgrade. The Pi’s capable of 1080p video playback at 60 frames per second now, up from 30fps prior—though the baked-in Epiphany browser chokes on 60 fps YouTube videos. Local videos as well as YouTube videos watched via the Iceweasel browser (installed separately) ran smooth as silk, however. More important is just how much the Raspberry Pi 3 fails to remind you that you’re using a $35 computer. Previous versions suffered from annoying pauses and lag when performing even basic tasks like checking Gmail or managing documents with LibreOffice, but those headaches are largely gone in the Raspberry Pi 3. You won’t confuse it for a Windows desktop or even a Chromebook, but when Raspberry Pi Foundation founder Eben Upton said “This 50–60 percent [performance improvement] has moved us over some sort of line, where it becomes a much more credible PC replacement,” he wasn’t lying. The Raspberry Pi 3 can definitely handle basic productivity tasks and web browsing. Though the Raspberry Pi’s ARM-based processors render it incompatible with many major benchmarks, we ran a handful of tests to quantify the generational improvement. To do so, we loaded the Raspberry Pi 2 and Raspberry Pi 3 with the latest Raspbian Jessie build maintained on the Raspberry Pi website. The same holds true for Google’s Octane 2.0 test, which we benchmarked using the Iceweasel browser. Higher scores are better. The Raspberry Pi 3 almost doubles the Raspberry Pi 2’s results. …as well as on all four of each system’s cores. The results show how many seconds it took for each machine to perform the operation, so lower results are better. As you can see, the Raspberry Pi 3 mopped the floor with its opponent yet again, finishing calculations minutes ahead of the Pi 2. Zoom zoom! And remember: The Raspberry Pi 2 delivered four to five times more performance than the original Raspberry Pi, so if you upgrade from the original model to the Raspberry Pi 3, prepare to be blown away by its speed. It’s impressive how (relatively) potent the $35 Raspberry Pi 3 can be, but the board won’t work by itself. You’ll need to connect it to a monitor or TV via HDMI; connect it to power via a 5-volt micro-USB cord capable of drawing 2.5 amps from the wall (I used a Kindle Fire charger; my Moto X’s charger wasn’t sufficient); and connect yourself via a USB or Bluetooth keyboard and mouse, though you’ll need to set it up using USB peripherals before you can activate Bluetooth pairing. Grabbing a case or at least a box to house the Pi is a swell idea too, because the board is fully exposed in its default state. The Raspberry Pi 3 needs a lot of extras to work. On the plus side, using Bluetooth peripherals can free up USB ports if you need them. You’ll also need to bring your own operating system and storage on a microSD card. (There’s a good chance you’ll need to microSD card adapter to slot the card into a traditional PC and grab that operating system, too.) There is a wide world of Raspberry Pi operating systems available, from more general Linux distros to laser-focused OSes built for a specific purpose, like Windows 10 IoT, OpenElec for media streaming, or a Raspbian build for Pi-powered weather stations. We tested the Raspberry Pi 3 with Raspbian, the Raspberry Pi Foundation’s officially supported operating system. The Foundation’s Noobs installer tool and setup guide makes getting your Raspberry Pi up and running relatively easy-peasy, even if OS installations aren’t your normal cup of tea. Raspbian’s a fairly stripped-down operating system that drives home the Foundation’s original goal for the Raspberry Pi—to create an affordable computer that children can use to learn computer science. Some of the programming software baked into Raspbian. Beyond basic OS tools like image viewers, the Epiphany browser, and the LibreOffice productivity suite, Rapbian’s packed with development software. You’ll find versions of Wolfram Mathematica, Python program creation tools, and Java integrated development environments, along with more directly entertaining educational software like Scratch, an animation coding IDE for kids, and Sonic Pi, “an open-source programming environment, designed for creating new sounds with code in a live coding environment.” There’s also Minecraft Pi, a version of that blockbuster game that requires you to use Python programming environments and ping the Minecraft Python API (among other things) to play it. Raspbian also houses a central “Pi Store” with hundreds and hundreds of additional tools, or you can always take the code-centric focus to heart and grab new software via a Terminal window. (Read: the command line.) Raspbian offers everything you need in a basic operating system. And that’s crucial, because the Raspberry Pi 3’s performance is finally good enough to allow it to function as a basic PC, rather than being restricted to wild maker projects or more practical purpose-driven singular uses. The Raspberry Pi 3 can still perform those specialized tasks, of course—and better than ever!—but now it can do more. I’m probably going to set up my daughter with one for her schoolwork, which is something I’d never have considered with the previous Raspberry Pi models. On paper, the Raspberry Pi 3 is just a more capable version of its predecessors, but it’s so much more than that in reality. While the Raspberry Pi 2 cured the original model’s pokey performance and paltry port selection, the Raspberry Pi 3’s extra oomph and new wireless capabilities help push it over a crucial usability hump. The connectivity hassles are gone. The slow and stuttering core experience feels smooth—or at least smooth enough—now. You no longer have to fight with the Raspberry Pi just to use it. And the Raspberry Pi 3 manages to achieve all that despite sticking to the same $35 price point. If you’ve ever had any interest in picking up a Raspberry Pi to tinker with, or simply want a dirt-cheap productivity computer, HTPC, or file server, the Raspberry Pi 3 comes highly recommended. It’s delicious.